The Ontario Soccer Centre features a 130,000 square-foot field house which includes a full-sized Astro Turf GT indoor turf field installed in June 2015 and FIFA 2 Star certified. The indoor field can be rented as a full field or divided into three small fields for single field rentals. 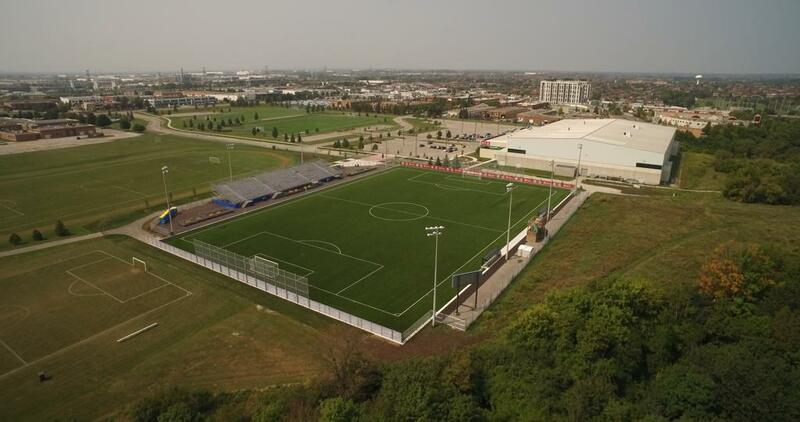 In July 2015, The Ontario Soccer Centre opened its outdoor stadium which has become home for Toronto FC's USL team, Toronto FC ll. Installed with AstroTurf GT turf and also FIFA 2 certified, the Ontario Soccer Stadium can accommodate up to 2000 spectators. Click here to take a tour of the stadium. In addition to its sports fields, The Ontario Soccer Centre houses several tenants, including the administrative offices of Ontario Soccer. Other tenants within the facility are The Sports Injury Rehabilitation Centre (SIRC), Ontario Women's Soccer League (OWSL), Ontario Soccer League (OSL) and the Provincial Indoor Soccer League (PISL). Easily accessible from Ontario's major highways, The Ontario Soccer Centre is ideal for training, leagues, tournaments, and clinics. Meeting space can accommodate groups up to 80 people and offers audio visual equipment and catering services to make your special event a success. For inquiries regarding field and meeting room rentals, special events and parties, please call 905-265-TURF (8873) or email soccercentre@ontariosoccer.net. Originally built in 1974 as a 10,000 seat outdoor stadium, and located in Toronto's Parkdale neighbourhood, the venue is now available to rent as an indoor facility through the winter months. New artificial turf was installed in 2008, and in the fall of 2009, the dome which originally covered BMO Field was transferred to Lamport Stadium. The full indoor field measures 68 metres by 105 metres, and allows user groups to play a full 11-a-side game. The playing area can also be divided into three smaller fields each measuring 30 metres x 60 metres. It is an ideal facility for recreational and competitive multi-sport activities for all skill levels and age groups.